Pervez Musharraf, former military dictator addressed a conference about Balochistan this past Sunday through Video conferencing. This Conference was arranged by Pakistan First, a group of retired Armed forces officers. Musharraf in his address said that 60% of People of Balochistan are with Pakistan and only 3000 to 4000 people are creating trouble who are backed by foreign elements. He further said that Billions of rupees were spent on development of Balochistan in his tenure as President of Pakistan. He also alleged that Talal Bugti and his son Shahzain Bugti has links with foreign elements and Marri, Mengal and Bugti tribes of Balochistan are involved in backing the insurgents. This is not first time Musharraf has uttered nonsense about Balochistan, he regularly gives similar statements. He was the person who started the current armed conflict in Balochistan. Pervez Musharraf ordered the establishment of Military cantonments in Balochistan in 2004. This led to starting of protests by local people most notably by Nawab Akbar Bugi. This created a tension which reached its climax when Nawab Akbar Bugti was assassinated allegedly on orders of General Musharraf in August 2006. Since then security situation in Balochistan has fallen in An Abyss, an endless pit and there is no hope of getting out of it. 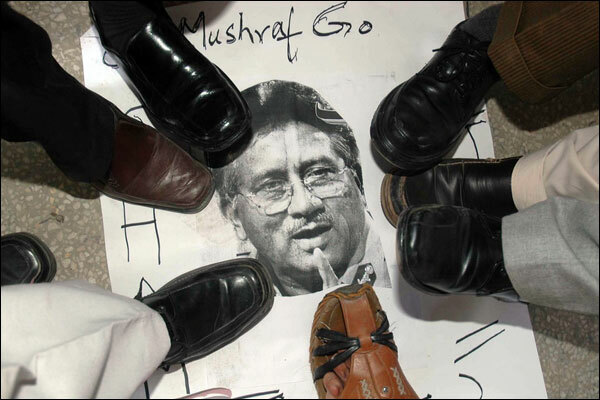 General Musharraf is responsible for the current security turmoil in Pakistan's most neglected province. He has been nominated in Akbar Bugti murder case and his arrest warrants have also been issued. He has chosen to stay abroad and make false statements about Balochistan rather than daring to come to Pakistan to face the law. Therefore, when talking about Pakistan or Balochistan for that matter he has no moral authority. Now lets discuss the claims made by him as mentioned above. He says that 60% population of Balochistan had rejected the separatists and are firmly with federation of Pakistan. I would not go in the debate about how much population supports separatists and how many support federation but by which means Musharraf has determined the 60% figure? On what basis? Has there been any survey or independent poll? Obviously no. No one knows the exact figures in this case and any such statement can't be anything other than speculation. Thats why Musharraf's claim about 60% is baseless. He also said that there are only 3000 to 4000 trouble makers in Balochistan. Again, what's the proof? Our dear General, as usual making false statements. In this case the exact number is also not established. The number of people with genuine grievances against government reaches hundreds of thousands, not a petty figure of few thousands. Another allegation by him is that Insurgents in Balochistan are backed by Foreign elements. There is no need to even raise the question about evidence as just like both of above mentioned statements the answer is obvious. Many intellectuals and columnists aligned with military establishment level such allegations about insurgents in Balochistan. These allegations are never backed up by any proof, because there is not any. The problem of Balochistan is internal, its a result of oppression of 65 years. People of Balochistan can be as patriotic as people of other provinces provided they are given due share in federation. The allegation of foreign involvement in Balochistan is just a diversion-tactic from the core issue by those who are not ready to take the responsibility for the mess created by them in Balochistan. Billions of rupees were spent on development projects, according to Musharraf, during his regime. There might have been movement of Billions of rupees in the accounts of Finance ministry but these developments can't be seen anywhere in balochistan. In fact major part of these funds were spent on construction of Military cantonments, which was also classified as a development project during Musharraf's rule! Talal bugti, the son of slain Nawab Akbar Bugti is one of the most outspoken and vicious critics of Musharraf, that's why Musharraf has levelled allegations on him that he has links with foreigners as well. Indeed this is not a bad way for Musharraf to malign his critics. He has also tried to put the blame of Balochistan issue on just three tribes i.e Marri, Mengal and Bugti. As a matter a fact almost all tribes of Balochistan are being victimised in balochistan thanks to the dirty game started by Musharraf. Musharraf can speak anything about Balochistan but not the truth. Now that's a an established fact after his latest address on balochistan. Musharraf delivered this "Full of Lies" address in a seminar organized by Pakistan First. Its a group formed by ex-officers of armed forces in January this year. This groups comprises of many of Musharraf's formers cronies who supported him in his unconstitutional acts. These officers along with Musharraf are culprits of the nation and should face the Law. The crimes of Musharraf are not limited to Balochistan only, he destroyed entire Pakistan. No one can forget the Lal masji Masacre ordered by him in july 2007, He imposed martial law twice in 1999 and in 2007. He should be held accountable for his crimes and brought to justice. A simple way to do this is to issues his red warrants through INTERPOL and then extradite him from the country where He is living. Unfortunately, it doesn't seem possible because Musharraf resigned after receiving guarantees from Saudi Emperor that Musharraf will be protected. No leader in Pakistan can dare to confront Saudi King. This means future of Musharraf is bright for time being but future of Pakistan is Dark, indeed. Anyone who still supports Musharraf can only be an ignorant person. Former dictator should face treason charges according to Article 6 of constitution rather than living a luxurious life abroad.